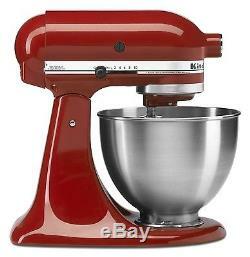 This KitchenAid Stand Mixer has a strong 300-watt motor that delivers the power to handle the heaviest mixtures, and mix large batches easily. The flat beater, dough hook, and the professional wire whip add to the versatility of the mixer. The flat beater is the ideal accessory for mixing normal to heavy batters. From cake mixes to firm cookie dough, the flat beater mixes quickly and thoroughly. The dough hook mixes and kneads yeast dough, saving both time and the effort of hand-kneading. The wire whip incorporates the maximum amount of air in whipped mixtures for fluffier whipped cream and angel food cakes. The tilt-back mixer head allows for easy access to bowl and beaters. Flat beater : Quickly and thoroughly mixes ingredients for everything from pancakes for breakfast to specialty treats for the holidays. Dough hook mixes and kneads yeast doughs, saving the effort of hand kneading. Wire whip will incorporate the mixtures for fluffier whipped cream and lighter angel food cakes. 300-watt mixer with 10 speeds; 4.5-quart stainless steel bowl accommodates large batches of heavy mixtures. Tilt-back head for easy access to mixture. Includes flat beater, dough hook, and wire whip; pouring shield not included. Bowl capacity: 4.5 quarts. Included accessories: Flat beater, dough hook, wire whip. ATTENTION ALL CUSTOMERS: ALL ELECTRONIC ITEMS ARE 110V. The item "Brand New kitchenAid Stand Mixer Tilt 4.5-Quart ksm8 All Metal Many Colors" is in sale since Thursday, October 2, 2014. This item is in the category "Home & Garden\Kitchen, Dining & Bar\Small Kitchen Appliances\Mixers (Countertop)". The seller is "usa-world-sales" and is located in Los Angeles, California. This item can be shipped to United States.